…as in “Resources and References” in infusion therapy? Ok, I know what you’re thinking… with the internet, who needs to have a home library of references and resources? One would just “google” any and all questions/references/resources. Well, I may be one of the few left who still have reference books and resources in my office and at home. Don’t get me wrong, I too use the internet, google and “google books” often to look up these resources / references but having the “real” book by your side is sometimes just what one would need to complete a research or a project. 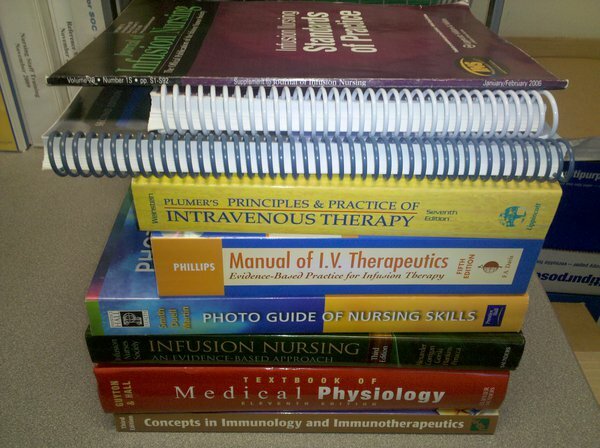 Whether you are a seasoned infusion nurse, a nursing student, or an RN looking for resources and references related to infusion therapy, infusion nursing or vascular access, here are a few R & R’s I often use and would highly recommend. Just for the purpose of disclosure, I was involved in either the writing of a chapter or the content review of some these books and resources. In addition, the list (not exhaustive) is in no particular order, preference or ranking, not in APA style 🙂 and I am not providing a review. There are several other resources such as journal articles, position papers and guidelines that are in electronic format available from regulatory, government agencies and specialty nursing organizations which I access often. Do you have any R&Rs you would recommend? Thanks for the recommendations – I have an IV medication book at work that I swear by, but for the life of me I can’t remember the name. I blame the fact that it is 7 am and my, uh, age….